UDG Camouflage Record Trolley Bag. Condition is Used. Dispatched with Royal Mail Signed For® 1st Class Large Letter. Color: Black. Front and side pockets for accessories. UDG Ultimate Digi Wallet Large Black/Orange DJ Music Producer Equipment Bag Case. 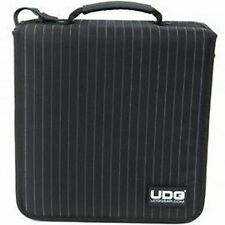 UDG Creator DIGI Hardcase Medium Durable DJ Case for USB Sticks/SD Cards - Black. The design is sturdy and will take practically everything that you can throw at it and still leaves your precious vinyl intact. Two hold all handles with nylon grip. Vinyl Capacity 90. Inside padded with special foam for extra strength and record protection. UDG Creator DJ Controller Hardcase Medium Black MK2 Protective Carry Case Bag. With its reinforced three-position handle, the rugged protection and improved roller housing is the SlingBag trolley DELUXE not only a stable means of transport for your records, but also a reliable companion. -Space for approx. 60 records - robust, water repellent nylon material - solid grip on the top padded shoulder strap - UDG security lock with number setting fit large front and side pockets for accessories and mobile - for: * 60 records / 50 12 CD sleeve * 1 CD wallet 280 / 2 CD wallet 128 * audio interface Rane SL3, SL4 / NI audio 6, complete audio 6 * Foldable DJ headphone * cable dimensions (W x H x D) : Indoor: cm: 31,5 x 32 x 20 / exterior: cm: 40 x 45.5 x 31 weight: kg: 4.5. Each design not only makes you feel good, they make you look great. Hard/Soft Case Soft. Warranty Full Manufacturer's Warranty. UDG Ultimate Flightcase Denon MCX8000. High quality, heavy duty flight case for the Denon MCX8000. UDG Ultimate Flight Case Denon MCX8000 Black not only transports your complete set up easily & securely, but also facilitates devices to be setup within minutes. 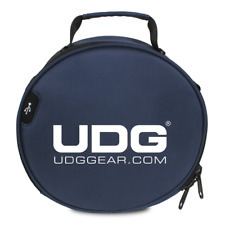 This UDG bag is a medium-sized bag that can accommodate approximately 50 vinyl records. The bag is perfect, because a low-cost, high-quality UDG product. The bag has a detachable and adjustable shoulder strap and two restraint straps that make it easy to carry. The content is additionally protected with foam padded PVC-reinforced walls. Features: • padded carrying bag • offers space for approx. 50 records • colour: black • removable shoulder strap • two sturdy nylon handles • robust, water repellent nylon material • mass outside in cm (W x H x D): 34 x 34.5 x 19 • Mass inside in cm: 32.5 x 33 x 17.5 • weight in kg: 1.2. This UDG series URBANITY with a design at the forefront and robustness at the height of the UDG quality Charter. Numéro de pièce fabricant U 7002 BL. UDG presents the urbanite on the road series, State of the art bags for the DJ/producer. Each theme gives you not only feel good, it makes you look good. The controller protection bag a wide selection lets you carry your. The main compartment includes a thick interior padding which protects jog wheels, faders and buttons of equipment of various sizes. It lets your digital controllers (like the pioneer DDJ SR / DDJ-SX or Numark NS6) sure majoring in store, while in the second compartment 2 laptops with a size of up to 19 "side by side or stand can store additional accessories like for example the UDG creator laptop. It has to accommodate space much more accessories in the trade, such as tapping phone or cable. 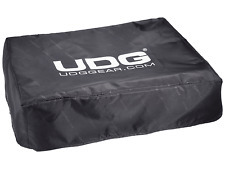 The UDG controller protective bag is i. 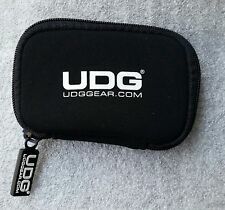 The new UDG CD SlingBag 258 is custom designed for digital DJ's, DVD buffs or everyone who needs to carry a large CD/DVD collection with ease and style. UDG CD Slingbag 258 Black / Grey Pinstripe. UDG CD Slingbag 258. UDG presents the urbanite series: innovative bags for mobile DJs and producer. the designs cause not only to feel comfortable, but make one look good. the controller sleeve makes it possible to transport them to a wide range of their equipment for their digital Set-Up of an appearance to the next. the main compartment is wrapped up with high density bubble foam, protects the jog wheels, faders, and buttons of various large equipment. you can a major in their digital controller, such as pioneer DDJ-SR/DDJ-SX or Numark NS6, safely store. In the second compartment (19Zoll), accessories like the UDG creator laptop have place for up to 2 laptops side by side stand or other accessories, such as: hard drives, headphones, cables. It including max 40 plates or 35 plus a 15.4 can be transported so laptop that perfectly fits in the removable inner pocket. There is also a detachable side pocket for mobile phone with velcro closure as well as a water bottle holder on the side. Thanks to the UDG bag even on a UDG trolley can be attached slings on the back, and it is fitted with a comfortable, adjustable shoulder strap, a durable handle and rubber feet to protect of the material at the bottom. Suitable for: * pioneer DDj-SP1 * Numark Mixtrack edge * novation launch CTRL XL * Akai MPK mini MK2 * Akai MPC 500 * novation twitch * Akai MPD226 * Hercules DJ control MP3 e2 * P32 of Hercules DJ controller specifications * material: water. Why people choose Bop DJ. BOP DJ Showrooms. Hard/Soft Case Hard. Durashock molded EVA foam. Back to the beginning: UDG again offered the vinyl bags, which at the time it all started. The ultimate soft case, in three sizes available, offer LP space for 60 or 90 records. The 90's bag is there apart from the classic Variant in the slanted version. Here the front can be with two rice locks easy to open and fold forward, so that the sorting and searching in a full record bag is possible. Technical data: EAN: 8718969210249 dimensions: cm: 37 / 37.5 / 22.5 weight: 2.2 kg. 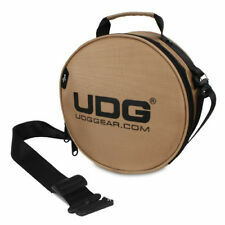 The UDG Slingbag trolley deluxe specially designed to protect your LP's during travelling. Constructed from high-quality fabrics, foam padded walls, electroplated zipper, comfort top-carry handle, detachable shoulder strap, and in-line wheels will provide secure and dynamic travel experience. Designed to Hold 15.4" laptop, DJ/Producer Accessories. Specially designed to cater for the laptop-based generation DJ affording them maximum functionality with performance orientated style. Hard/Soft Case Soft. Light and ultra stable: UDG with the CDJ/DJM/battle Creator offers for transporting CD players and mixers mixer bag a very lightweight and extremely strong case made of EVA plastic. With the UDG creator CDJ/DJM/battle mixer case black (U8443BL) there is an alternative to classic wood cases, which is simple and easy to transport, but provides perfect protection. Suitable for: - pioneer CDJ-2000NXS2 - pioneer DJM 900NX2 - pioneer PETITELADY27-1000MK2 - pioneer CDJ-900NXS - Rane sixty eight - Rane sixty four - Allen & Heath Xone 43C - Allen & Heath Xone: PX5 - Allen & Heath Xone: 92 specifications: color: black dimensions: cm: 46 x 39 x 13.5 weight: 1.54 kg material: Dura shock molded EVA foam. A perfect size bag for a minimalist DJ set! 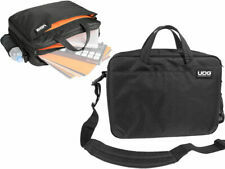 Durable, water resistant bag - holds up to 60 x 7" records. - Holds up to 60 x 7" records. Authorised dealers - full technical support. Online since 1997. UDG Creator DIGI Hardcase Small Protective Accessory USB Stick Carry Case Silver. Back to the beginning: UDG again offered the vinyl bags, which at the time it all started. The ultimate soft case, in three sizes available, offer LP space for 60 or 90 records. The 90's bag is there apart from the classic Variant in the slanted version. Here the front can be with two rice locks easy to open and fold forward, so that the sorting and searching in a full record bag is possible. Overall dimensions: cm: 37 / 37.5 / 32.5 weight: 2.8 kg. 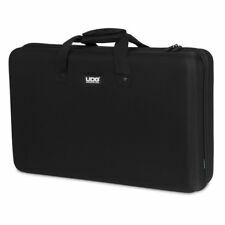 UDG Urbanite Water Repellent MIDI Controller Flightbag Carry Case Large Black. # Larger side and front pockets provides convenient storage for headphones, magazines and accessories. # Electroplated zippers and integrated combination lock. UDG Creator Laptop Stand. Material : High quality aircraft grade anodized aluminium. It's the only laptop stand for DJs that balances solid, secure construction, portable, foldaway, height and angle adjustable, tray rotatable, low-weight design and excellent affordability. Premium headphone carry bag made from water resistant ballistic nylon 1680D - with shoulder strap. Authorised dealers - full technical support. Online since 1997. Hard/Soft case Soft. Handle type Adjustable strap. It's the perfect budget priced padded DJ bag for the starting DJ and a perfect chance for every DJ to have an original UDG product. 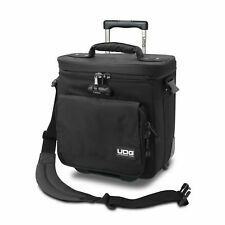 The UDG Starter record bag is a perfect bag for the starting DJ. Record bag holds 50 records. Udg Turntable Dust Cover - Coverage Dustproof for Turntable or Mixer from 19 "